Several months ago, I wrote a blog about an innovative approach to ending the bullying epidemic, which is referred to as bullyproofing (click here). Unlike many of the current anti-bullying movements, which are ultimately designed to punish the bully, my goal is to empower the bullied through a process of mental discipline. At the core of most bullying incidents is a concerted effort, on the part of the bully, to create an imbalance of power. As I mentioned in my previous blog, this process usually results in the bully “renting space” in another person’s mind, thus giving them the power they desire. Therefore, a fundamental component of the bullyproofing process is to help students understand and access the power of their mind, which in most cases is the primary target of the bully. Last week I had an opportunity to gauge both the frequency and type (or form) of bullying at several of the schools I work with. When asked to share what they felt were the most common forms of bullying at their school, many of the students mentioned things like gossip, rumors, name calling, and teasing. This was certainly no surprise to me as I’ve always maintained that it’s the subtle forms, those that take place away from a teacher or other adult, which make up a large part of bullying incidents in general. When asked to share various strategies for handling these types of incidents, the most common answer I received was to “walk away”. While I wasn’t surprised to hear this answer, it is always cause for concern as I question its effectiveness. Have you ever tried to simply “walk away” from feelings like anger or sadness? You see, physically walking away from a bully is a viable solution, but trying to walk away from the resulting feelings isn’t. It’s the psychological impact of bullying that concerns me the most, therefore simply walking away becomes a short term solution to a long term problem. Here’s where the bullyproofing process comes in. It’s natural for a child to feel upset or angry following a bullying incident. However, if we empower them with the necessary mental tools to effectively manage these emotions, the end result is a bullyproofed mind. Below is a brief summary of a wonderful book I like to read as part of my bullyproofing lesson. It’s called Simon’s Hook and it shares a very effective bullyproofing strategy. Simon is teased incessantly by his classmates for having a strange looking haircut. After abruptly leaving school one day due to his intense sadness, Simon rushes home to tell his grandma what had happened. When she hears his story, she replies by asking, “Simon, why did you take the bait?” With a look of confusion on Simon’s face, she proceeds to tell him that bullies are like fisherman and that their bait is the words they cast in your direction. 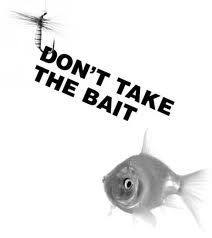 As a free fish, you have a choice as to whether or not to take the bait. If you choose to take it, the bully reels you in. If we want to end bullying, we must teach students how to avoid taking the bait. This process begins by developing the two critical skills of self-awareness and self-management, which are at the core of everything I teach in the Lenses of Leadership program. Click here to watch a video excerpt of me teaching this concept to a group of 8th grade students.